The Spur LED chandelier from Tech Lighting is a wholly modern interpretation of classic multi-arm chandelier, five arms each feature a cluster of five glass spurs dramatically extending in opposing directions. Whether you select the warm Aged Brass finish or the sleek Satin Nickel finish, each chandelier features twenty five individual frosted glass spurs which accent the LED light sources for an unmistakable high-end look. With its medium scale and plentiful, fully dimmable LED light output, the Spur chandelier is an incredible choice for making an impactful statement as dining room lighting, kitchen island lighting, living room lighting or foyer lighting. 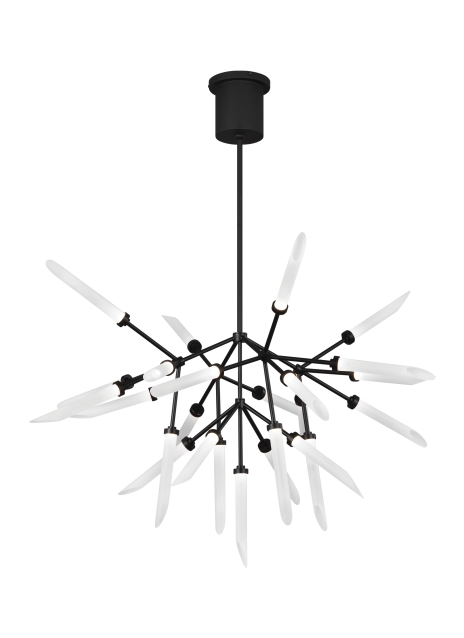 If you have something larger in mind, be sure to check out the Spur Grande chandelier also available from Tech Lighting. Includes (25) 2.6 watt, 91 delivered lumen (2285 total delivered lumens), 2700K, LED modules. Fixture provided with 36 inches of variable rigid stems (includes one 12 inch & two 24 inch stems) in coordinating finish. Dimmable with most LED compatible ELV dimmers. Can be installed on a sloped ceiling up to 45°.